For the 2005 Thai film, see Tom-Yum-Goong. Tom yum or tom yam (UK: /ˌtɒm ˈjæm, - ˈjʌm/, US: /- ˈjɑːm/; Thai: ต้มยำ, RTGS: tom yam [tôm jām] ( listen)) is a type of hot and sour Thai soup, usually cooked with shrimp (prawn). Tom yum has its origin in Thailand. In recent years, tom yum has been popularised around the world. The words "tom yam" are derived from two Thai words. Tom refers to the boiling process, while yam refers to a Thai spicy and sour salad. Tom yum is characterised by its distinct hot and sour flavours, with fragrant spices and herbs generously used in the broth. 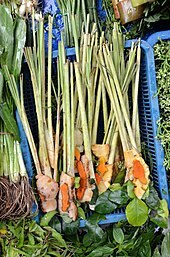 The soup is also made with fresh ingredients such as lemongrass, kaffir lime leaves, galangal, lime juice, fish sauce, and crushed red chili peppers. The 1997 Financial Crisis in Asia, which started in Thailand, is sometimes referred to as the "Tom Yam Kung Crisis". The taste of Tom yum is based on the sour and spicy tastes. A paste called Nam prik pao is prepared as a base of the soup, to which water, herbs and meat are added. The Nam prik pao is made from roasted chilies, shallots, and garlic and the ingredients are best grilled on charcoal fire. The basic ingredient of Tom yum is shrimp or pork. If shrimp is the base ingredient, put it in soup after the soup boils. If pork is the base ingredient, put it in the soup before it boils. The most popular Tom yum base is river shrimp called “Tom yum Goong”. The essential ingredients of Tom yum are herbs such as lemongrass, galangal, and kaffir lime leaves. Other ingredients are also important especially Thai chilies, mushroom, coriander leaf (cilantro), tomatoes, sweet white onions, lime juice, sugar, and fish sauce. “Tom yum nam khon” is a variety with coconut milk or evaporated milk. Tom yam nam khon (Thai: ต้มยำน้ำข้น) is a more recent variation from the 1980s. common with prawns as a main ingredient, evaporated milk or non-dairy creamer powder is added to the broth as a finishing touch. Tom yam kathi (Thai: ต้มยำกะทิ) - coconut milk-based tom yum — this is often confused with tom kha kai ("chicken galanga soup"), where galangal is the dominant flavour of the coconut milk-based soup. tom yam kung (Thai: ต้มยำกุ้ง) - the version of the dish most popular among tourists, is made with prawns as the main ingredient. The dish originated during the Rattanakosin Kingdom. Tom yam pla (Thai: ต้มยำปลา) is a clear fish soup that was traditionally eaten with rice. It used to be the most widespread form of tom yam before mass-tourism came to Thailand, for fresh fish is readily available almost everywhere in the region's rivers, canals and lakes as well as in the sea. Usually fish with firm flesh that doesn't crumble after boiling is preferred for this type of soup. Tom yam kai (Thai: ต้มยำไก่) is the chicken version of the soup. Tom yam po taek (Thai: ต้มยำโป๊ะแตก) or tom yam thale (Thai: ต้มยำทะเล) is a variant of the soup with mixed seafood, like prawns, squid, clams and pieces of fish. Tom yam kung maphrao on nam khon (Thai: ต้มยำมะพร้าวอ่อนน้ำข้น), a version of prawn tom yum with the meat of a young coconut and a dash of (coconut) milk. Tom yam kha mu (Thai: ต้มยำขาหมู), made with pork leg. These require a long cooking time under low fire. In the modern popularized versions the soup contains also mushrooms - usually straw mushrooms or oyster mushrooms. The soup is often topped with generous sprinkling of fresh chopped cilantro (coriander leaves). Sometimes Thai chili jam (nam phrik phao, Thai: น้ำพริกเผา) is added: this gives the soup a bright orange color and makes the chili flavor more pronounced. Less well known outside Thailand is tom khlong (ต้มโคล้ง), a spicy sour soup where the sourness, however, does not derive from lime juice but through the use of tamarind. Tom som (Thai: ต้มส้ม) are soups that are also very similar to tom yum but most often do not contain lemongrass or kaffir lime leaves. Depending on the type of tom som, the acidity can be derived from lime juice or from the use of tamarind. ^ "Tom Yum Gai – Suwanee's Kitchen". Chiang Rai Times. Retrieved 18 January 2016. ^ "The homemade hot sour soup that packs a punch". whitsunday coast guardian. Retrieved 28 September 2017. ^ "Tom Yam Kung : Not only tasty but with medicinal properties - Thiaways". thaiwaysmagazine.com. Archived from the original on 1 February 2016. Retrieved 18 December 2015. 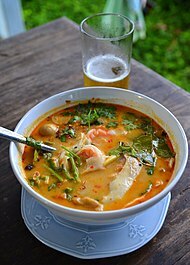 ^ a b c "Tom Yum Soup Recipe (ต้มยำกุ้ง) - Authentic Thai Style". Thai Street Food, Restaurants, and Recipes | Eating Thai Food. 15 August 2014. Retrieved 26 April 2017. ^ "Thai Roasted Chili Paste Nahm Prik Pao) Recipe - Food.com". Retrieved 26 April 2017. ^ "Overview of Tom Yum soup from late 19th-century Siam to present day Thailand". Thaifoodmaster. Retrieved 25 January 2017. ^ a b "Ancient Siamese Recipe for Tom Yum Soup with Snakehead Fish, Roasted Chili Jam and Green Mango (First Published in 1890) (Dtohm Yam Bplaa Chaawn, ต้มยำปลาช่อนแบบโบราณ อย่างหม่อมซ่มจีน ราชานุประพันธุ์ ร.ศ.๑๐๙)". Thaifoodmaster. 25 January 2017. Retrieved 25 January 2017. ^ "Tom Yam Kung". thaiwaysmagazine.com. Retrieved 27 February 2015. ^ "Tom Yam Kung Recipe, Hot and Sour Soup with Shrimp". thaifoodmaster.com. Retrieved 4 March 2010. ^ "Spicecuisine.com". spicecuisine.com. Retrieved 27 February 2015. ^ "Merry's Kitchen - Sour and Spicy Chicken Soup (Tom Yam Kai)". melroseflowers.com. Retrieved 27 February 2015. ^ "ต้มยำขาหมู". YouTube. 10 March 2011. Retrieved 27 February 2015. ^ "Allthaifood.com". www.allthaifood.com. Retrieved 6 April 2018. ^ "Clay's Kitchen : Tam Ra Ahan Thai (Thai Recipes) ตำราอาหารไทย". panix.com. Retrieved 27 February 2015. 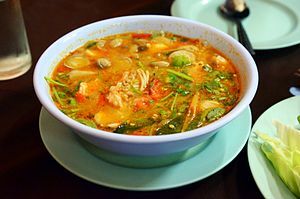 Wikimedia Commons has media related to Tom yam.